The CALL element is quite similar to a simple instruction. 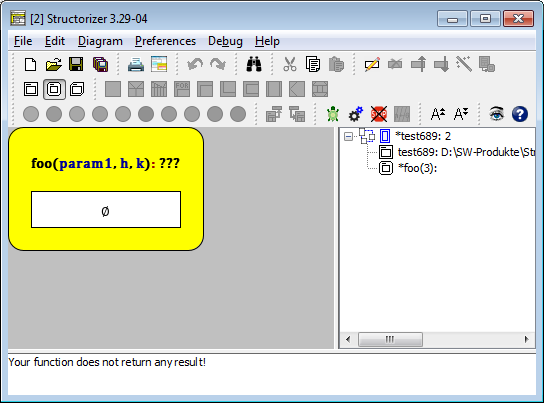 The difference is that the executed instruction is a call to a user-defined subroutine (also see Type) represented by another diagram. The argument list may be empty, but the parentheses must not be omitted. The arguments (value1 through valueN in the templates above) may not only be represented by literals or variable names but by arbitrary valid expressions with operators and built-in functions. The only restriction is that the expressions may not contain further custom-routine CALLs. The argument expressions are to be separated with commas. A call must provide as many argument values as the called routine has parameter names in its header. They are mapped one by one in the order of the parameter list. If there are overloaded subroutines (i.e. several subroutines with same name but different numbers of parameters) then the argument number of the call decides which of the routines gets invoked. Since version 3.29-05, subroutines may have optional parameters at the end of the parameter list. In this case, the call may omit as many argument values (from right to left) as parameters in the routine header are equipped with default values. These default values will be used instead of the omitted arguments. 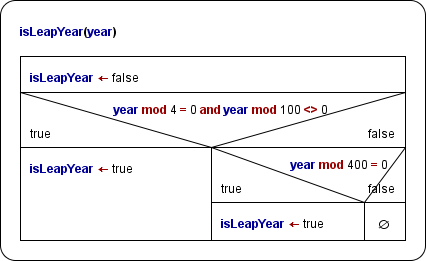 If an argument is given then the default value will no be used. 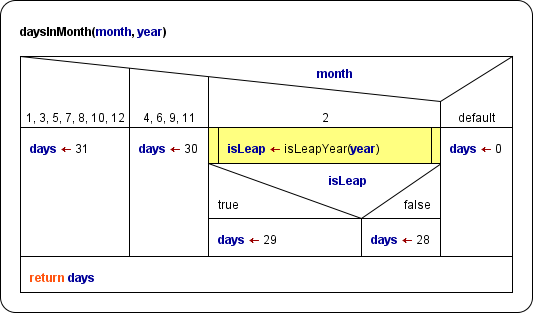 The calling two-parameter function diagram daysInMonth above is of course also meant to be called by another algorithm. On the Runtime Analysis manual page you will find an example of a pretty complex bunch of routines co-operating in the task of sorting an array; the core algorithm there (quickSortRecursive) is a recursion example. 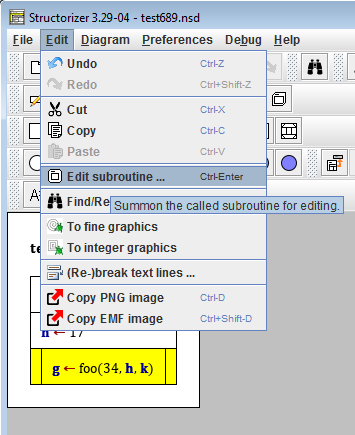 There are some very helpful features to facilitate the creation of CALL elements or their corresponding subroutine diagrams. If you realize that a designed algorithm has grown too large and should better be decomposed then you may "outsource" parts of the diagram into subroutine diagrams. 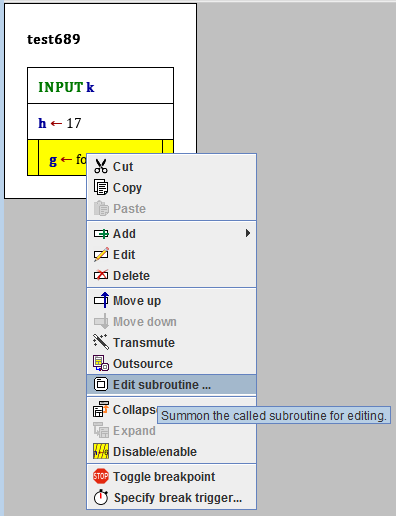 Simply select the logically consistent element subsequence you want to make a subroutine from and click the menu item " Outsource". This will move the selected elements to a new subroutine and fill the gap with a Call to that subroutine diagram. See Outsourcing for details. As you can see, the new routine diagram will automatically be added to the group of the parent diagram, possibly a new group may have been generated for this relation.